Comprising about 9% of Singapore’s population, the Indians have their own enclave in Singapore which will make you feel like you are in a neighborhood in Delhi, Mumbai or Chennai. It is where you can relish an authentic Indian experience right in heart of Singapore. An ethnic district in Singapore, Little India is located east of the Singapore River and across from Chinatown. The third largest ethnic group after Chinese and Malays, the Indians started migrating to Singapore in 1819. Most of them were young men who were workers, soldiers or convicts. In fact, the area where Little India is located was said to have been a settlement of Tamil convicts. It was during the turn of the 20th century when it became an ethnic Tamil neighborhood. The community is served by Little India and Farrer Park MRT Stations which links Little India to the numerous neighborhoods in Singapore. It is 19 kilometers from Changi International Airport. If you can’t visit India, then you must travel to Singapore and enjoy Little India. Although the community is an attraction by itself, you can take a stroll along its streets and visit the Sri Veeramakaliamman Temple, Leong San Temple, Sri Srinivasa Perumal Temple, and the Sakya Muni Buddha Gaya Temple. Enjoy shopping at Tekka Market, Mustafa Centre, Little India Market, and Tekka Mall where you can practice the art of haggling. Craving for authentic Indian cuisine? Head to Jungle Tandoor Restaurant, Komala Vilas, Jaggis North Indian Cuisine, Khansama tandoori Restaurant, or the more expensive Delhi Restaurant and Mustard Restaurant. 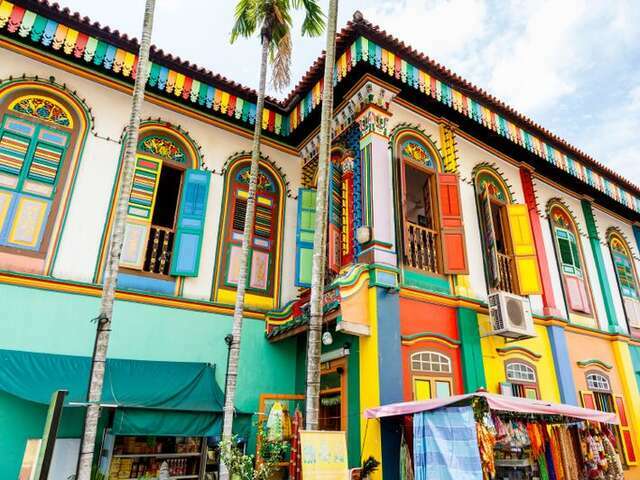 One of the most vibrant and energetic districts in Singapore, Little India will awaken all your senses. Take it all in when you book a trip to Singapore to visit Little India.